A Leicester cricket camp has provided the latest challenge for Pranav Dhanawade, the Indian schoolboy who made history by scoring 1,000 runs in a single innings earlier this year. On 5th January, Dhanawade became the first person to reach four figures, hitting 1,009, and the 16-year-old has now visited England for the first time as part of an overseas tour, and he has been working on his game at the City Cricket Academy's (CCA) Summer Cricket Camp. "The City Cricket Academy is very good and I like it, with very good quality facilities," Dhanawade said. "I have learned very much, including how to play in English conditions. "While playing in games at the Summer Cricket Camp I have scored two 50s but so far not 100," he added. Mobin Sheikh, who has coached Dhanawade since the age of six, brought him to England as part of Mumbai's Worli Cricket Club team. He has joined more than 250 other young cricketers from Leicestershire, India, Dubai and the UAE attending the camp, which is run on two sites, Leicester Grammar School and the University of Leicester's cricket ground. As well as training they have been learning from expert coaches and playing matches. Don Bhagwati, CCA director, said: "It’s a real pleasure to host Pranav at our Summer Cricket Camp and hope this experience will help him. "His achievement was phenomenal and a really big story in the cricket world. I wish him the very best and hope he keeps working hard at his game." Back in January, Dhanawade batted for two and a half days to score his 1,009 in a HT Bhandari Cup inter-school tournament game, going well past the previous record of 628, set by Arthur Collins in 1899. He hit 59 sixes and 127 fours in 395 minutes before his side, KC Gandhi School, delared on 1,465 against Arya Gurukul School. 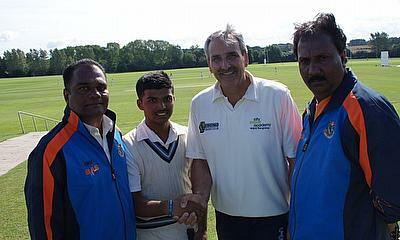 "At CCA we believe in making sure everyone enjoys the game while also reaching their full potential.," Bhagwati added. "Pranav has fitted into our ethos perfectly, practicing and playing matches with a smile on his face. "We have hosted many overseas players so far this year. Welcoming players like Pranav not only benefits their game as they learn to adapt to different conditions, it also enables local cricketers to develop and enrich their game."